Let’s face it. Digging is fun for dogs. That’s pretty much why they do it. Even dogs that aren’t bored like to dig. And once they learn how much fun digging is it can be hard to stop them. If you are a gardener there is nothing more frustrating than finding a newly planted bed emptied and the plants that were in it torn to shreds. 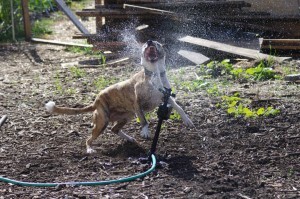 Squeek decided that it was her very own water toy. She would go nuts for it. Unfortunately it’s made from plastic and eventually she broke it. 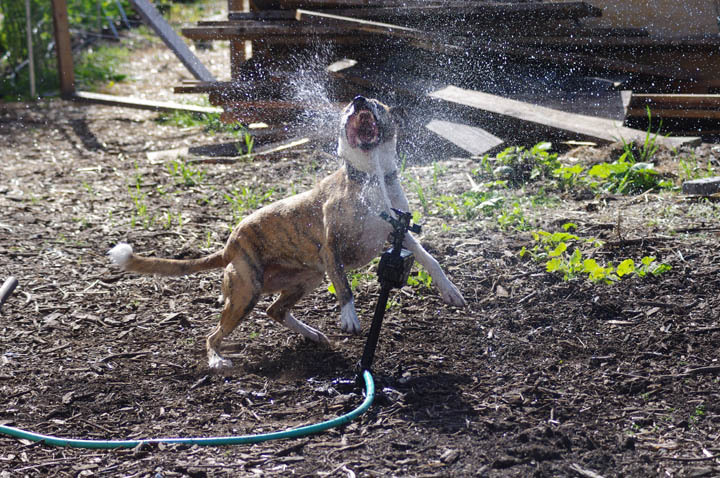 She now has a metal sprinkler but it’s not nearly as fun since it doesn’t have the motion detector. Previously it was just random spots in the yard where they would dig. Damage would occur but it was usually fixable. Then one day they both decided to outdo themselves. We had gone out and left them in the backyard. Our garden was fenced off from the main yard so we normally didn’t worry about it. When we got home we realized that they had learned how to open the garden gate. My 4’x16’x10″ deep bed that I had just planted with seedlings was completely devoid of soil. All that soil was strewn in a 10′ radius around the bed. It was horrifying. When we put in a brick patio we had a bunch of leftover sand. From our experiences taking the dogs to the beach, sand was the funnest medium to dig in ever. In the corner of the yard we never use we decided to make them a sand box. Because Riley likes to dig cooling holes to lay in during the summer we made sure the new sand box had plenty of shade and we kept it moist. To get them used to it we would bury treats and toys in the sand for them to find. For the most part it seemed to have worked. They didn’t dig in my garden beds anymore once they got that sand box. It did require some work putting sand back in the box but overall it did what it was supposed to. At our current home we no longer keep them in the backyard when we’re not home. Squeek still digs occasionally but it’s usually to hide a toy or bone in a spot that doesn’t bother the yard too much. Leaving them inside is really the only way we were able to cure them from digging. Now if I can only figure out how to get Riley to stop stealing eggs. What an interesting story. It seems we are lucky, our Pirate, a Pinscher, is not interesting in digging at all.